My first book, chosen by Robert Pinsky as the winner of the first annual Barrow Street Press Book Prize in 2003. 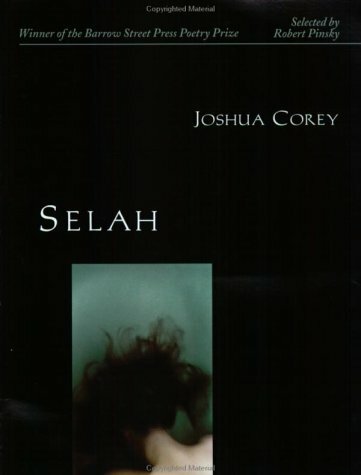 Corey's is an almost manically intelligent voice, and Selah is full of high-wire acts.... Verbal daring is a specialty here. Corey's lines swoop and dart without ever losing their reference to the gravity of the real world: "Her hair was my bouquet of calf- / skin gloves. It glowed like butter / turning bad..." "You straddled past and put me in your pocket." "The lips of water / kiss me into a chamber, into a basement / where pipes have burst." In the masterful "Echolocation Suite by James McNeill Whistler," the poet's pyrotechnics dazzle us almost to the point of blindness. But this isn't just sparkle; there's a deeply felt connection to emotion and the terrible cycles of life as well.